An absolutely fantastic read. Olson writes history with the pace and intensity of a novel. Characters (real characters) are exposed bit by bit through their actions to have their strengths (Wendell Willkie) and weaknesses (FDR and Lindbergh) picked open to view. I have always liked FDR but now like him much less. I have never liked Lindbergh and now dislike him much more. the likes of which we have rarely seen. Always extremely tentative, FDR refused to lead, to try to convince the American people and thus Congress. He did invent Lend-Lease, but then did nothing to assure any substantial flow of material to the Brits. Without Pearl Harbor, he would likely have allowed Hitler to conquer Britain and where would we be now if that had happened? Even after Pearl Harbor, we were lucky Hitler made a mistake and declared war on us. 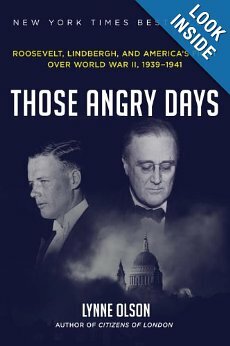 FDR’s inability to make a decision is portrayed in a way I have never read before. It makes you want to give him a swift kick. In addition to being a ditherer, he is shown as a mean nasty man. Such disillusionment. Lindbergh never learned from his experiences, which were many and varied. He never grew beyond the super-hero status he achieved early in his life. He comes across as a thoroughly immature and unlikable man who thought during the 1930s that Hitler and the Nazis were “not so bad,” and who, even after the Holocaust, never recanted. He seems to have been completely indifferent to the plight of the Jews in Germany. Lindbergh equated the Nazis’ wholesale murder of Jews with other war crimes. This is absurd. The murder of Jews was not a war crime. It had nothing to do with the war, in fact, it hurt the German war effort. shows his ignorance and insensitivity, as well as his antisemitism. He did know how to fly an airplane, but apparently nothing else, including an appreciation of his own limits. If he had emotions, they were never seen. He reminds me of some of our over-paid athletes today, celebrities with nothing to offer when off the field. Wendell Willkie, FDR’s opponent in the 1940 Presidential election, agreed with FDR to not make certain information into a campaign issue, due to national security considerations. Later, after he had lost the election, he urged all Americans to support the President’s foreign agenda, and later he travelled abroad for FDR during the war to interact with our allies. And he didn’t even like Roosevelt! He died too early, in 1944, at the age of 52.
and our own recent history. The Republican obstructionism then was as bad as it is now. Had it succeeded, the U.S. would have left Hitler to conquer both Britain (likely) and Russia (possible), and maybe even us. It is clear from Olson’s writing that there was little concern in the U.S. for what Hitler was doing to the Jews, even after Kristallnacht in 1938. Antisemites like Henry Ford, the America First group, and Father Coughlin put out their message of hate virtually unopposed. American Jews were reluctant to push harder than they did, fearing backlash antisemitism here. So Hitler was free to go ahead and murder six million Jews. In sum, highly recommended. A great pick for our book club opener in December.